Whether you need an update to your current prescription or you are in need of glasses for the first time, Dr. Sina J. Sabet and his team of eye doctors provide exceptional eye care and service. Our office has a complete collection of prescription lenses, frames, and contacts to ensure you feel great about your eyewear and vision. Our staff will help you select the style that fits your needs as well as your personality. Designer Frames: We carry both designer eyeglasses and sunglasses. Contact Lenses: We provide eye exams and fittings for a perfect fit. 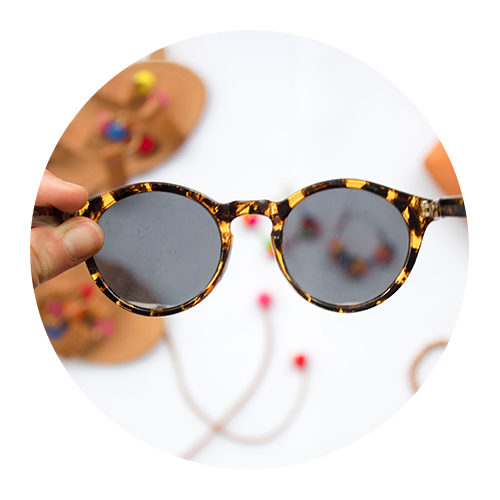 Sunglasses: Prescription sunglasses will help protect your eyes and vision. Lens Treatments: For scratches and glares. Transitions Lenses: Sunglasses and prescription glasses in one to protect your eyesight. Choosing a pair of prescription glasses can be a big decision — it’s not only about how well you can see with the eyewear, but also how you look and feel in them. There are hundreds of different styles, shapes, and colors, each with their own benefits and drawbacks depending on your needs. Our eye doctors will help you make the best decision possible so that you can feel 100 percent confident walking out of our office. Even though you don’t need to select a particular style as you would with glasses, the fit and comfort of your new contacts are paramount. At your appointment, you will be fitted for contacts that are made specifically for your eye shape and vision needs. If you have never worn contacts before, our staff will give you some tips on how to put them in, take them out, and we’ll provide you with some information on how to take care of them. When you work with Dr. Sina J. Sabet and his team, you can look forward to receiving personalized service from start to finish. Our eye doctors are passionate about providing care that goes above and beyond. Your eyes are what you see the world around you with and should be treated with the highest quality of care. If you have any questions about your glasses or contacts prescription, please reach out to us today!